First off, happy new year! This will be my first post of 2013. This month, Topbox came out with what are called “Prive” boxes meaning that they will feature products from one brand in a box. As a subscriber, you are able to create a “wish list” for the Prive boxes that you desire in the upcoming month and if you get chosen, your regular Topbox will be swapped with a Prive box. I think it’s neat that you are able to take a peak at what brands will be featured in the next month. I personally did not choose for February because I missed the deadline, lol. Oh well! Also, my birthday is next month; I wonder if Topbox will include a little something extra? Clarifying Lotion – This is part of Clinique’s 3-step skin care system which caters specifically to your skin type. I have combo skin, so I received number 3. I believe this acts as a toner, but it contains alcohol in it which I don’t like because it can dry out my skin. Not sure if I will be giving this product a try because I am using a different toner that works well for me at the moment. Rinse Off Eye Makeup Solvent – I am currently using a different eye makeup remover that I love and after reading reviews on this one, I’m not sure how well it will compare. It is a very decent sized sample though– hope it works! Colour Surge Eye Shadow Duo in Strawberry Fudge – This is a cute little duo that you can keep in your purse for touch ups. It definitely reminds me of the Clinique Colour Surge Quad in “Pink Chocolate.” These colours are nice for a casual daytime look. Even Better Clinical Dark Spot Corrector – I actually purchased the full size of this a year or so ago to try it out. After using the full bottle, I didn’t really notice a difference on the dark spots of my face even though this product has been “clinically proven” to reduce them. This was just a miss for me. Overall, it’s a great idea that Topbox came out with these Prive boxes, but I also do enjoy using products from a variety of brands. That way you can see what works and what doesn’t from all the 100000x brands out there. Topbox looks amazing! 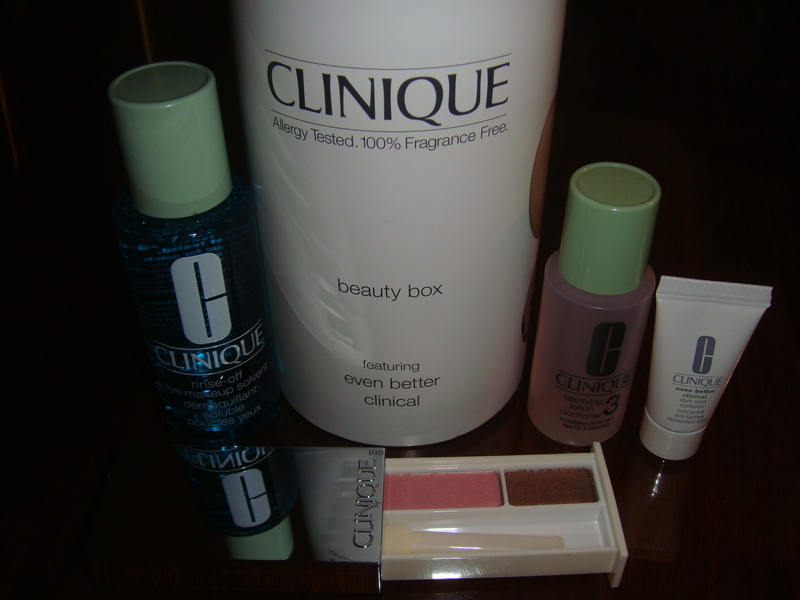 Clinique is one of my favorite brands. I just may sign up.